After graduation came a full time job and with a job came moving out-of-state. Moving out-of-state meant leaving the knitting group I’ve loved and enjoyed for the past 2 years and the 11 ladies who have become my “grandmas”. 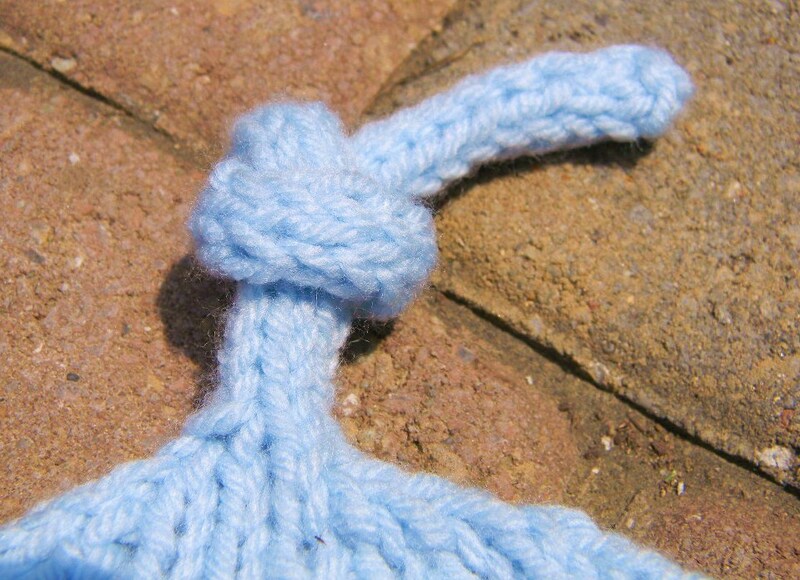 Oh Knotty Knitters of the Public Library – You will be missed. 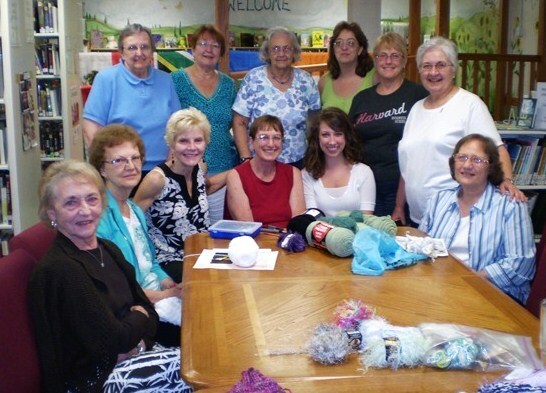 Last Thursday, July 28th, was the last knitting group I’ll have for a while. I don’t know when I’ll be able to take off in the middle of a work week to drive 3 hours home to knit with my girls. 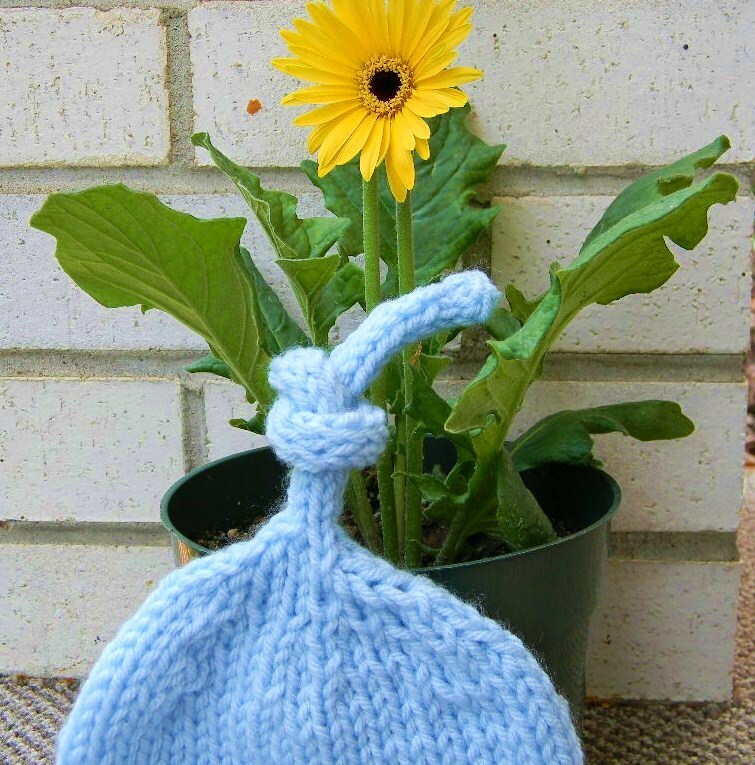 This past week, just as our knitting was winding down for the evening, I heard “surprise!”. Startled, I saw everyone put down their needles and smile at me. I looked over my shoulder only to see a beautiful cake and across the table to see 11 smiling faces. It was the first time I cried about leaving. My parents came to share in the surprise and it was a lovely few moments spent with dear friends (and delicious cake). I don’t think I’ll ever find a group as lively as the Knotty Knitters, even though they’re all over 65. No one can replace them! Grannies Wendy, Dolores, Carol, Nancy, Gloria, Helen, Suzan, and Marge – How I miss you already. Thursdays from 6 – 8pm won’t ever be the same. I recently visited a local yarn store that opened by my house. It’s cute. They remodeled a downstairs and sell novelty yarn and pottery. 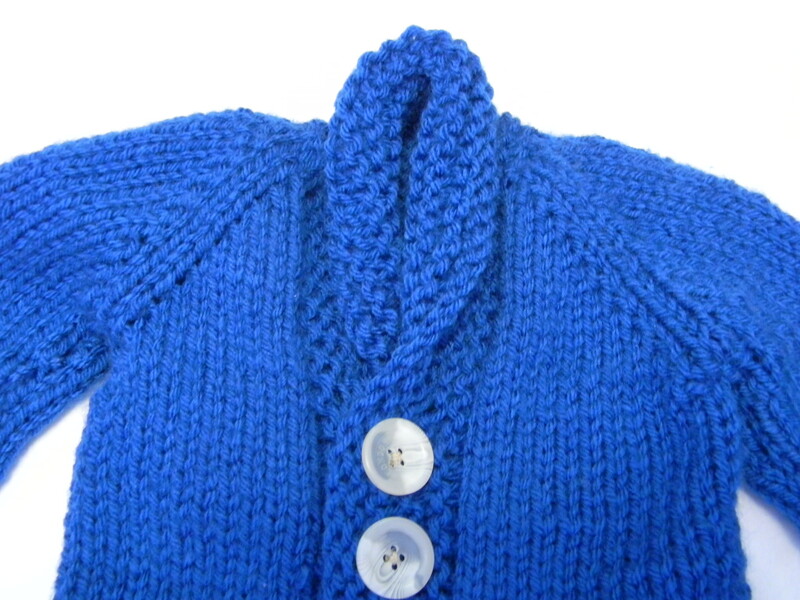 A few weeks ago, I spotted a store sample hanging by the window: A cotton knitted baby cardigan. Now I’m not planning on having kids for a few years (have to find me a man first), but who can resist a miniature sized anything? I found the pattern from Plymouth Yarns and upon seeing it was “free with yarn purchase”, I made a yarn purchase. 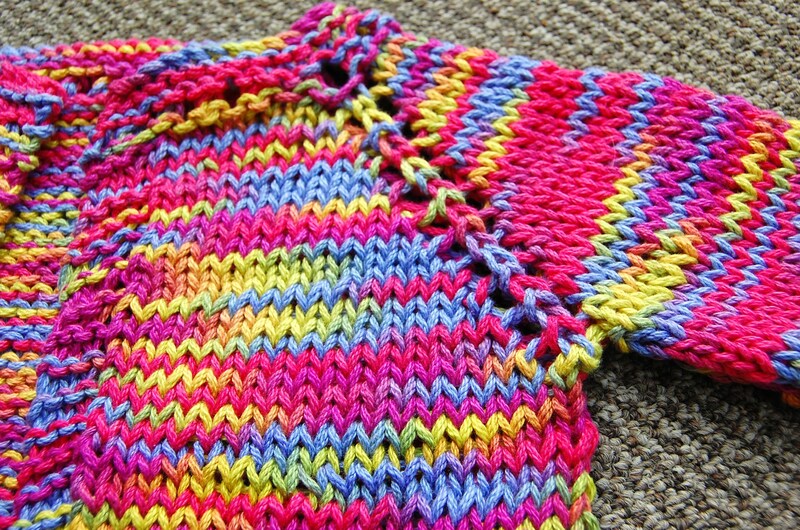 Free pattern in hand and two skeins of Fantasy Naturale in Rainbow and I was ready to knit. The pattern worked up fairly quickly and I’m pleased with how it turned out. I followed the pattern exactly except I didn’t make the sleeves as long so it’s a 3/4 length knitted baby cardigan instead. It was a top-down raglan knit so super easy and minimal seams – just what a crocheter/ dabbling-knitter needs! I especially like the bold color palette. You don’t normally see babies in brights, but I rather like it. What do you think? I imagine a knitting group in the town of Nantes, France would call themselves the Nantes Knotty Knitters. I’m here in the beautiful French countryside on a 11-day “Best of France tour” with my school. We’re touring towering chateaus, exploring exotic cathedrals, and walking through wonder-filled villages. 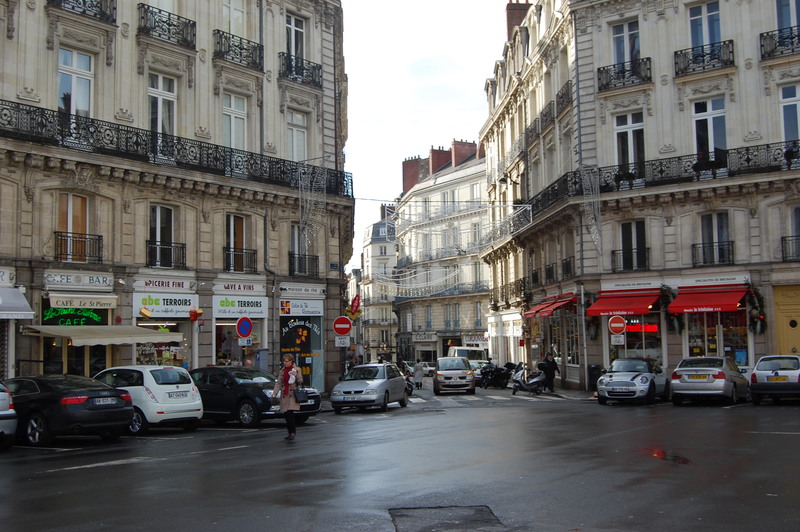 On one of our free afternoons, a few of my friends and I walked the streets of downtown Nantes at a place called Commerce. The streets are quaint, the shops expensive. Reminds me of a scene from the Jason Bourne movies. I told my group the one thing I’d like to visit in France was a yarn store. Wouldn’t you know that right before we left, my best friend (bless her) happened to spot a yarn store. Ahh! So good! After promising my group I’d only look around for 5 minutes (ha good one), I went in. There were rows of yarn hanging on wooden railings. I was in heaven. They priced each type of yarn then would wind off as much of the skein as you wanted. Some lovely green silk caught my eye and at 3.20 Euros for 50 grams, I was sold. I walked up to the counter, but had a problem. I didn’t speak French and none of the 5 girls working spoke English. My five years of taking Spanish failed me. I think I managed to say “j’adore” and pointed to the skein I wanted. The clerk smiled and nodded. She wound off 50 grams for me, I paid and left. Wonderful! Excuse-moi for the tired looking picture of me, but I have to share. My friend managed to snap this awkward picture of me before we heard “No fotos”. Totally worth it. I’m a Yarn Harlot… or at least enjoy reading about one. I’m currently reading “Yarn Harlot: The Secret Life of a Knitter” by Stephanie Pearl McPhee. This book is a reflection of my soul. ( If you’d like to get a little kicky flavor of her witting writing, check out a sample of her book her on Google Books). I promise if you’re a knitting or crocheter, you won’t be disappointed. And coming from me, a big non-reader, consider this a glowing recommendation. Granted, I’m only 40 pages through, but I just got the book from a lady at my knitting group (thanks, Helen!) and am so pleased with it, I can only show my appreciation through blogging. Future note to self: finish reading a book in its entirety before sharing your opinions. If you eat, breathe, and sleep knitting or crocheting you have to check out this book. 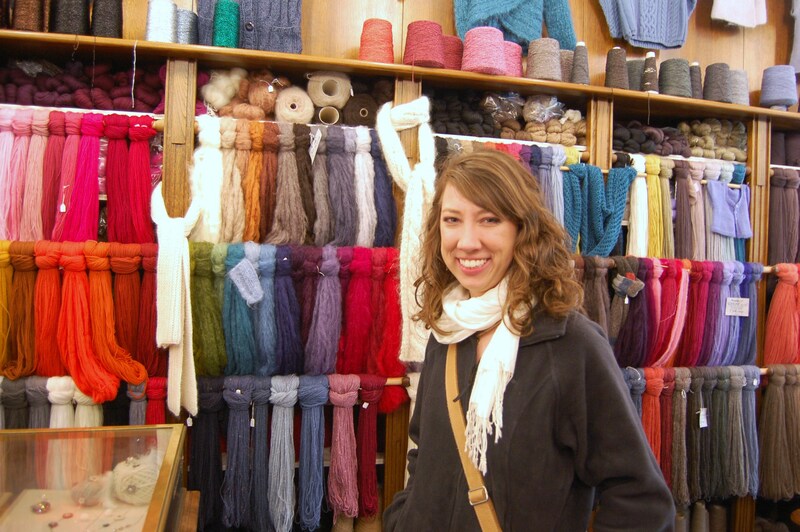 Reading Stephanie’s stories will make you realize you’re not alone and not as crazy of a knitter as you realized. You’re just like the rest of us yarn harlots. There is hope. Sock knitting ramblings, etc, etc, etc. If that blurb doesn’t incentivize you to put down your needles and pick up a copy of Yarn Harlot: The Secret Life of a Knitter by Stephanie Pearl McPhee, I don’t know what will. Happy reading! Since it’s Friday, you’re probably expecting Free Pattern Friday. Sorry to disappoint, but I have something better than a free pattern, I have the creator of all things patterns. 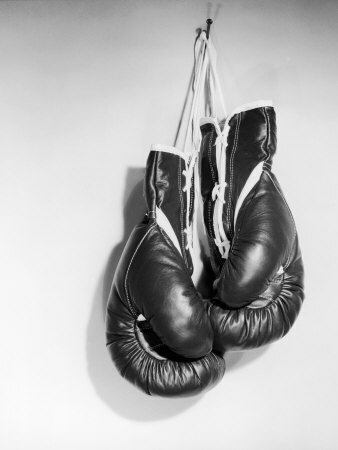 Happy FPF – Famous Person Friday. When you think knitting patterns – classic, fitted, exquisite stitch detail – who do you think of? Just one name comes to mind, really: Debbie Bliss. 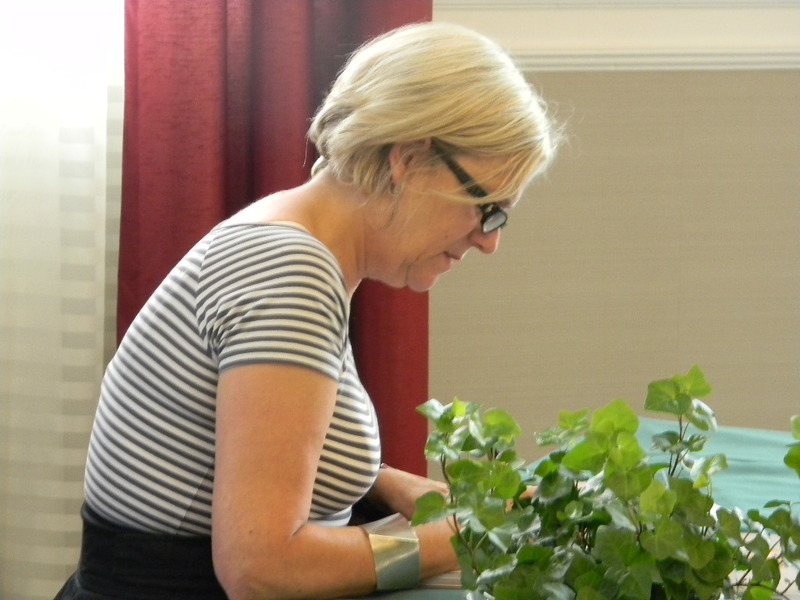 Her yarn line, Debbie Bliss, was designed to be true to the knitter she was. Plain, simple, classic. She worked as a nurse for two year before gradually building her knitting empire; It’s never too late, she encourage the audience, to pursue your dreams. While I was the youngest member in attendance (nothing new to me, though, because of my 65-year old knitting group) I thoroughly enjoyed the evening. Her accept was lovable, her demeanor calming, and her knitting insight a true reflection of the knitting prowess she is. 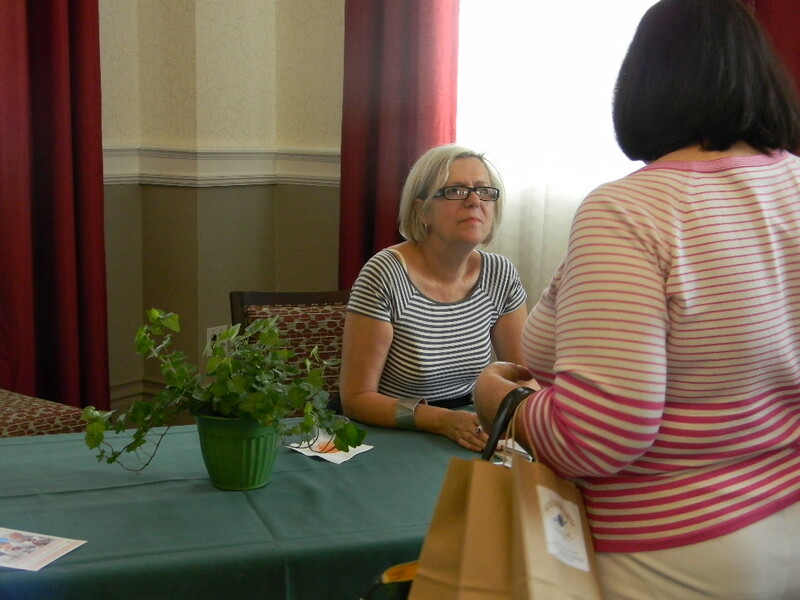 And as an added bonus, everyone in attendance will get a new copy of her book… can’t wait! 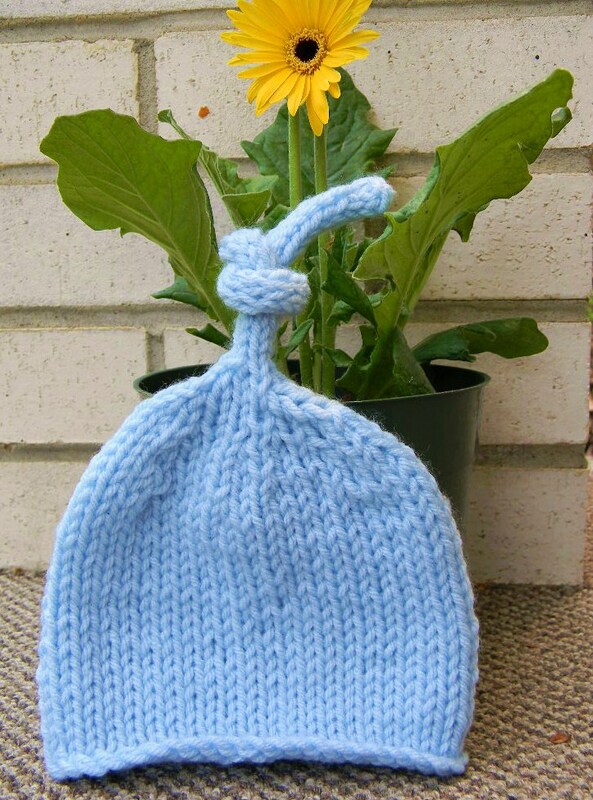 This knit baby hat was my first venture into the world of DPNs. After watching this Youtube video on how to knit with double pointed needles, I finally mastered the technique. I had heard knitting with DPNs was equivalent to wrestling with an octopus, but it wasn’t nearly as bad as everyone makes it out to be. If you’ve never used big-bad (ooooh) DPNs before, try it. I thought having to sew up circular knit projects when I was done was no big deal. Wrong. 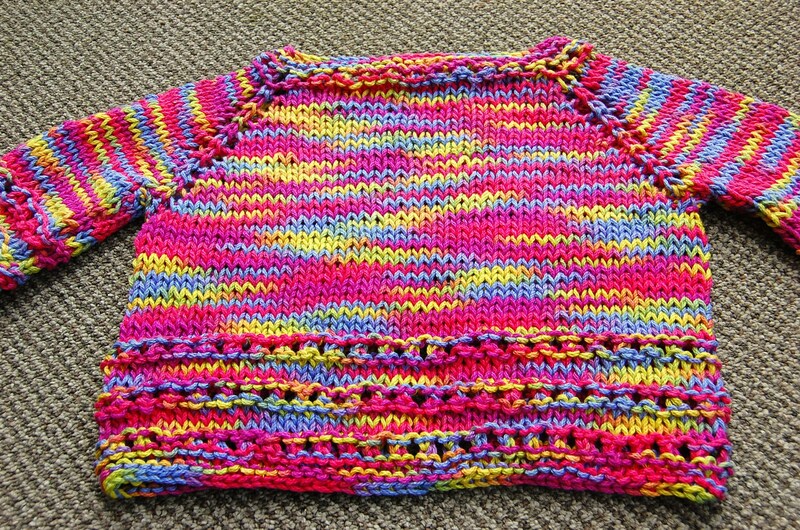 Knitting in the round on DPNs is so, so, so much better. Try it… you’ll be pleasantly surprised. Size: Newborn. Finished hat measures 12″ in circumference and 5.5″ inches high, not including tie. 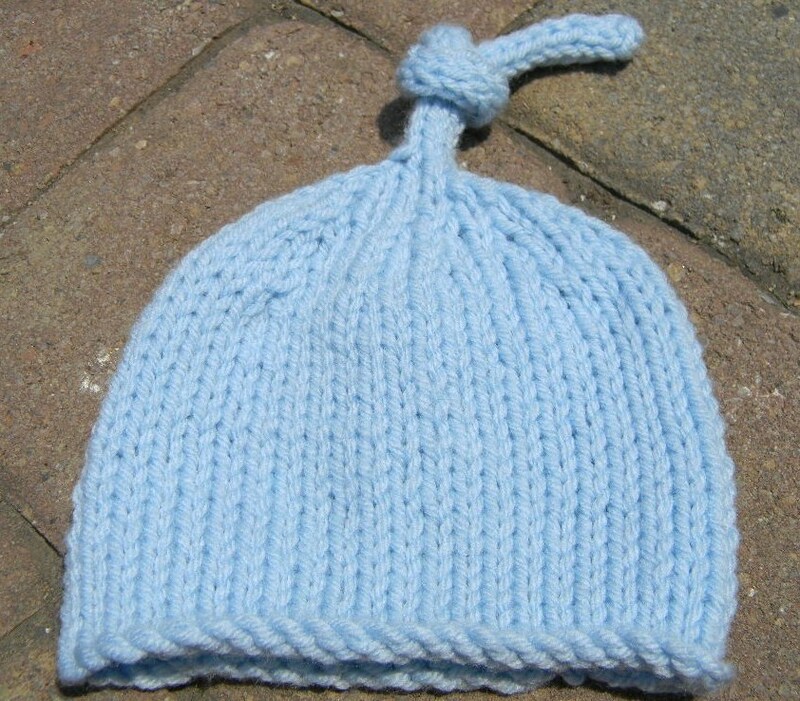 Knit in Stockinette Stitch (K every round) until hat measures 4″ from bottom. Repeat Rounds 1 and 2, decreasing until only 4 sts remain. Continue to K4 sts to form an i-chord that measures 6-7″. Use Darning Needle to Sew in Ends. Loosely knot i-chord at top of hat. Laugh at all your other friends who knit this on straight needles and have to sew up the seam. 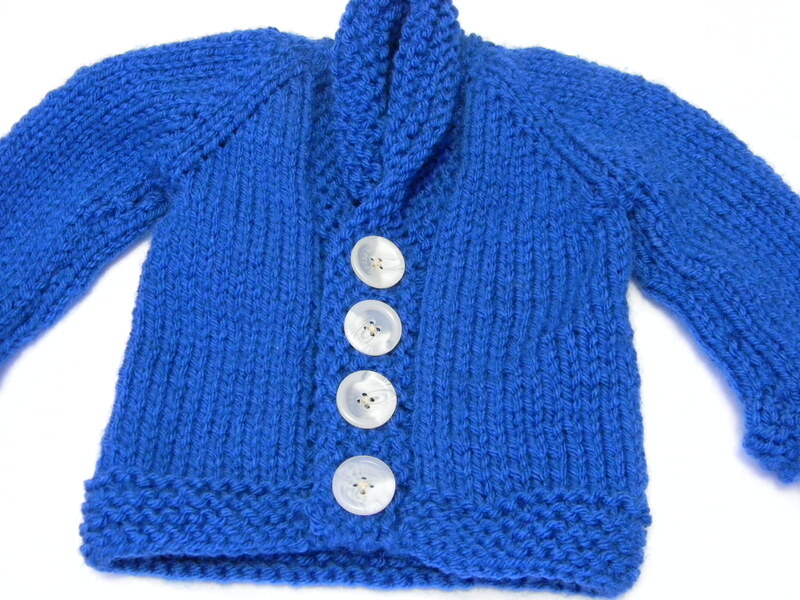 I’d had my eye on this free knitting pattern on Ravelry: Baby Sophisticate for a while. I’ve never really had an excuse to make it, though. I’m a single 21-year old that has zero use for a knitted baby sweater. Enter my good friend who’s pregnant with her second kid. (Suz, I’m sorry if you’re reading this, just act surprised when I give this to you the next time I see you.) On Monday, I learned she was having a boy and cast on for this knitted baby sweater Monday night. Finished it by Tuesday. Can’t stop looking at it. 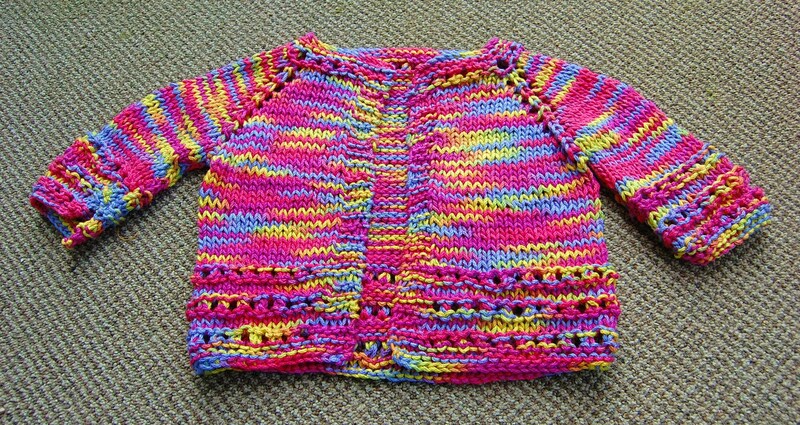 For more project details and where you can get this free knitting pattern for this baby sweater, check out my finished project page on Ravelry. Only downside: My friend isn’t due ’til October so it’s another 5 months until we can try it on her little tyke. Today was the first Thursday I’ve been able to go to my weekly knitting group in over 3 months and it made me realize how much I’ve missed them. It’s one thing to crochet by yourself, but to be surrounded by people you can “talk yarn with” is another. Our small group, the Knotty Knitters, meet at the local library from 6-8pm on Thursdays evening to knit, crochet, and share stories about life. I’m the youngest member of the Knotty Knitters (by about 40 years), yet I absolutely love the time I spend with my fellow needlecrafters. These women are so thoughtful and genuine – not to mention knowledgeable about all things knitting – that spending 2 hours with them is not nearly enough time. I wish I was home more so that I could go more often, but alas, college calls. Don’t worry, ladies – I’ll be back for another round (ha, crochet joke) soon enough. Pattern is mainly for my own reference so it’s not completely precise, but feel free to enjoy! Just eyeball it and go. Contact me if you have any questions and I’d be more than happy to help! Hat was named for my roommate in college, Hannah, who is classy and indie and wonderfully beautiful, just like this hat. Knit 4×4 rib for 2 1/2 inches (or however long you’d like your band to be). 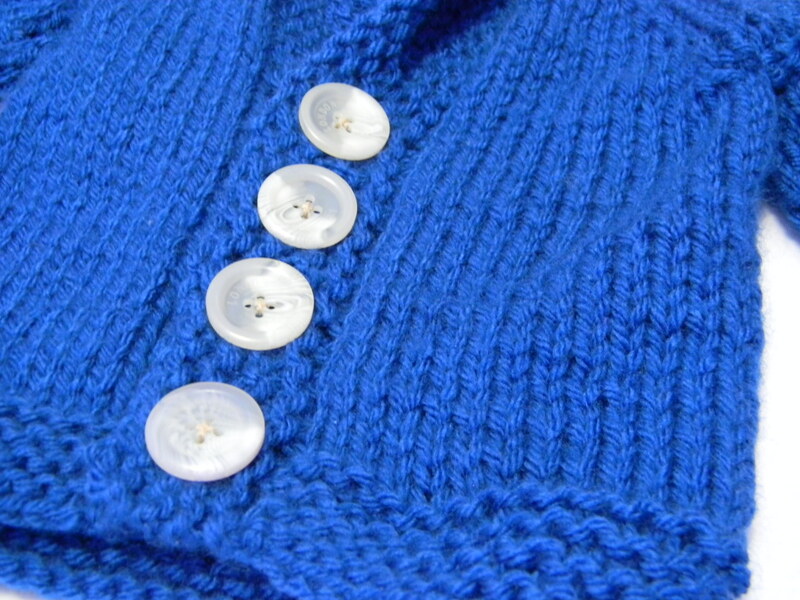 Next Row: Switch to Mistake Ribbing For Body: *k2, p2* across until 2 stitches remain. P2tog (you need an odd number of stitches for the mistake ribbing). Continue to work Mistake Ribbing (*k2, p2* across until last stitch, p1) until hat measures 7 inches from cast on edge. Next Row: Begin to decrease. k 1, *k2tog, p2tog* across. 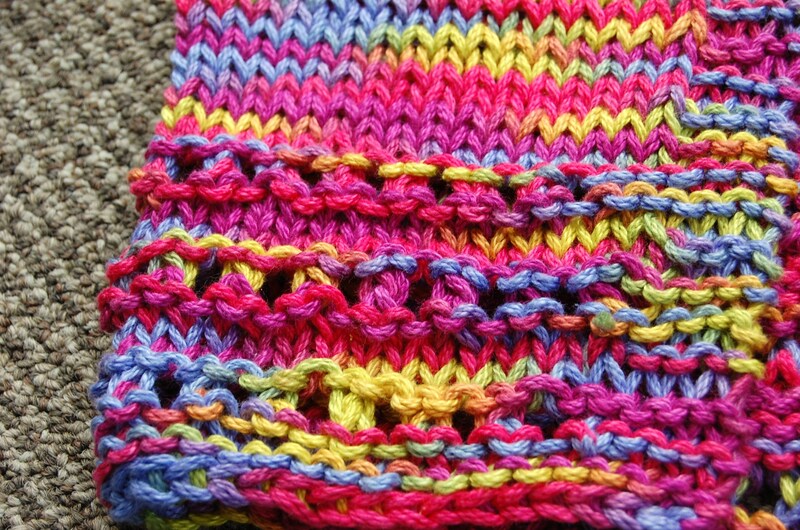 Continue decreasing for 3 Rows until only 7 stitches remain. Cut yarn and weave yarn through remaining stitches on needle, gathering hat shut. Sew up side seam of hat and Enjoy! Cast on 48, do 4×4 rib as instructed. Start next row (in the round means next stitch) p1, k2, p2 around till last stitch, and then p1. and then repeat. next row would start with K2. you can see how the K’s and p’s line up, and the other verticals are every other as the should be. You just need to know when you are going to have 3 purls next to each other, or just 1 purl. Continue to work mistake ribbing until hat measure 7 inches from beginning. All this knitting mumbo-jumbo got you stumped? Don’t worry – visit JJCrochet’s Etsy Store for hand-made crocheted and knit hats!